Comfort food. Pikelets for comfort and love. Oh Winter, you were so cruel. I’m not sad you’re gone. Like most families, ours was struck with a nasty flu this year. The first victim was my little 5 year old who is generally very stoic and would prefer to be at school than stay at home. Here’s to hoping she keeps that attitude throughout her teens or at least part thereof. Wishful thinking I know but who’s to say? Her older sisters do not share this attitude. Now, when my children are unwell I’m one of those Mums who makes chicken soup the good old fashioned way. Just like your Dear Granny would make. Right from scratch. It’s a bit of a bother but it’s so good for you and it’s very easy to eat. The added bonus is you feel all glowy and good about the great Parent thing you did to nourish and heal your loved ones. It’s nice. It’s good to notch up some great parenting things. So, my children when ill are keen on making little requests that “might make them feel better.” Little Miss 5 just lurves pikelets. Simple little comfort food pikelets. YUM! They are so very very easy to make and you hardly need any ingredients. Afterwards there’s only a little bit of washing up. These babies are a real winner as there’s hardly any waiting time involved. Unlike pancakes and crepes that require resting time you just whip up a batch and start cooking them straight away. Seriously with two pans you are done in 20 minutes! Here’s a recipe you might like to file away under comfort food ideas. Or morning tea. Or afternoon tea. Or party food. Or good old fashioned yummy treats. Enjoy! 1. Sift the dry ingredients into medium sized bowl and make a well in the centre. 2. Stir in the beaten egg and milk then add the melted butter and mix until you have a smooth and pouring consistency. 3. Heat a large frying pan on low to medium heat. If you have a non stick pan this makes life easier. If not then use a little butter or oil for greasing the first lot. Two pans on the go at once gets the job done quicker! 4. Drop tablespoons of batter into the frying pan (or use two pans at once) and allow room for spreading. When bubbles begin to appear on the pikelets then turn them over. Cook until lightly browned. 5. For absolutely best results serve your pikelets warm with butter or jam and cream. 6. 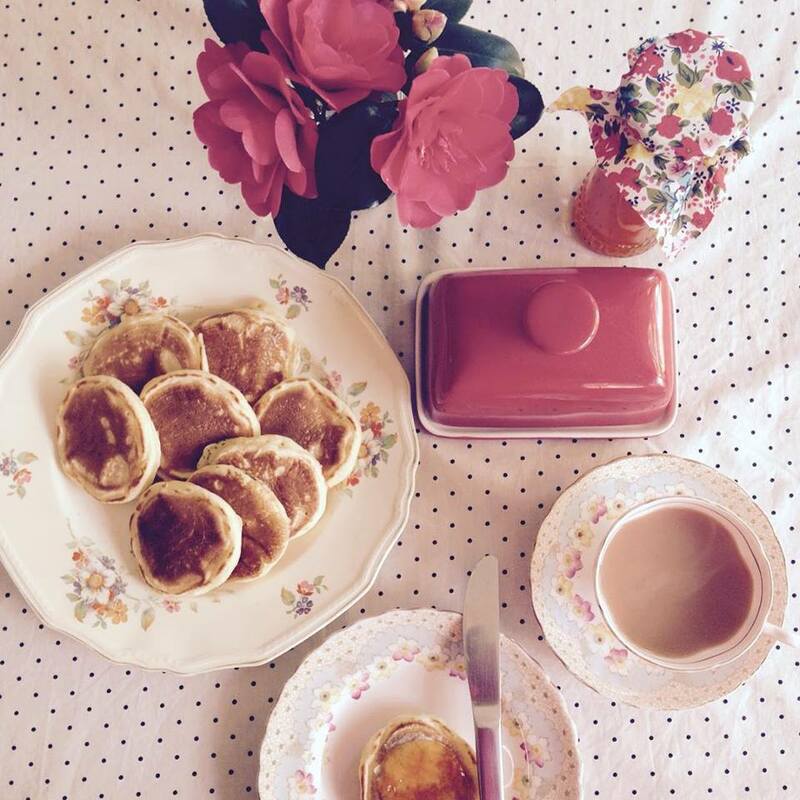 Enjoy in the delight of homemade delicious pikelets and savour the happy memories you’re creating. Share the love with me and tell me your family’s favourite comfort foods. Good bye Winter. Hello beloved Spring and gosh I missed you! Sausage Rolls Recipe – a real crowd pleaser! BLACK & WHITE PARTY – SO HOT RIGHT NOW!